The Best Drugstore Full Coverage, Matt Finish, Long Lasting Foundation? Welcome back to another post, thank you for reading this one! Now, if you have read any of my other posts before or follow my blog, then you should know how much I love foundation. I don’t know why but I have some sort of obsession and it is by far my most purchased makeup item. I think it’s because I like getting the base right and I think that part is very important, so I enjoy trying out new bases to achieve a look I am happy with. 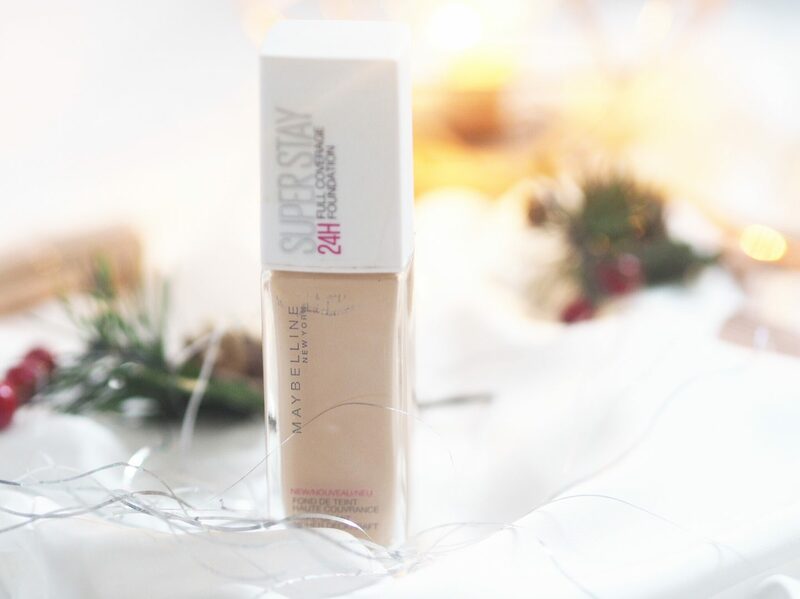 Today, I will be talking about the Maybelline Superstar 24hr Foundation. Now, I don’t actually wear a lot of Maybelline products on a day-to-day basis, although, don’t get me wrong I think they’re a great brand, so maybe I should invest in some more products. However – with this product, I was drawn to buying this one after watching Sophdoesnails youtube video, where she reviews it on her channel. It’s worth a watch if this post does/ or even does not encourage you to go and buy this foundation. I love finding a really good long-lasting drugstore foundation. To be perfectly honest, I was put off buying drugstore ones for years because I never found one that lasted as long as the likes of double wear and some of the more expensive high street ones. However – I’m pleased to say, the drugstore foundations have definitely upped their game and that’s why I’m really enjoying wearing some of them. You can pick this up for £9.99 at a variety of different retailers, including Boots, Superdrug and ASOS. I actually picked it up when it ha 20% off on ASOS, and you can find it here. I think for a drugstore foundation, that’s quite a reasonable price, especially when you can pick ip up for a discounted price. So as it says in the title, this foundation has a nice matt finish which isn’t drying on the slightest and leaves your skin looking flawless. ALSO ladies…..it is long-lasting! For a drugstore foundation, this is definitely by far the longest lasting I’ve tried. It is so worth you investing your money in this just to try it as I LOVEEEEE it, if you can’t already tell! On Asos, you can choose from 11 shades, which as usual for drugstore brands, it isn’t a huge amount, but still it’s not bad! I’ve been wanting to try this foundation! Do you think it would work good on oily skin? Yeah, my skin is getting pretty oily and it’s really good, it doesn’t really budge! Awesome! I’m going to try it out! Thank you. Ok cool! I have to try it! Thanks again. This one sounds lovely. I usually go for a dewy look with my dry skin but a matte finish would be ok if it’s not drying at all. Looks fab! I’ve been keeping my eyes peeled for this! It seems fabulous. I could always order it online, I suppose, but sometimes I like checking out the shade range in person.